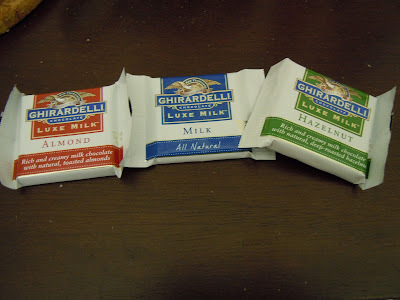 The Clean Plate Club: Ghiradelli Chocolate: GIVEAWAY! I received an email about a month ago from Katelin, a representative of Ghiradelli chocolate. She offerred me the opportunity to try their new Luxe Milk line of chocolates. My family used to joke that my first word was chocolate because I loved it so much - so this was, without a doubt, an offer I couldn't refuse! My college roommates Kiley and Diana and I had planned a night to make dinner and catch up....and I decided that these chocolates would provide the perfect dessert for us. Since we were roommates in college for 3+ years, I knew these two ladies would make the best taste-test crowd. From our experiences in our little apartment I know that the 3 of us are probably the best prepared to compare chocolates, since we have been known to eat a LOT of the stuff. To our dinner I brought the almond, milk and hazelnut varieties. I like that Ghiradelli has the option of buying a large bar, or buying bags with individually wrapped bites. This makes it easier to portion control - or, if you're me, to treat yourself with a piece of chocolate in your lunch bag. I'm usually more of a dark chocolate fan, but I was really impressed with how rich and deep the flavor of this milk chocolate was. We all agreed that the taste of the chocolate in all three varieties was rich and creamy. We unanimously voted the almond flavor the best of the bunch. Who can resist a rich milk chocolate studded with crunchy almonds? We could not, we ate most of these. The hazelnut was good, albeit a bit disappointing - we were hoping for a ferrer-roche type experience. These nuts just tasted off, not rich or roasted enough. Maybe we got a bad bag? The milk was our least favorite - but only because it was plain. We like nuts in our chocolate. So if you like a plain milk chocolate, this might be the one for you. It reminded us seriously of cadbury milk chocolate, but meltier. YUM. Would you like to try the Ghiradelli Luxe Milk chocolates? Leave a comment below telling me which flavor you would like to try! If you tweet the contest (then leave another message telling me that you did) you can have a second chance to win 2 coupons for free Ghiradelli Luxe Milk chocolate! I will use random integer generator to choose a winner on Monday November 1st! Chocolate contest? Sign me up! I definitely want to try the Ghiradelli Luxe Milk chocolate in the hazelnut flavor! I'd try, well, anything! with chocolate, but I'd like the almond the best. Mmmm Chocolate! I too am usually a dark chocolate person, but sometimes a really good piece of milk chocolate is heavenly. I'd love to try the Almond or Hazelnut! OK this is the giveaway for me! I eat dark chocolate at least once each day. I would love to try the plain Milk Chocolate (I don't eat nuts)! Oooh. I'm not a big fan of plain milk chocolate either. I would probably go with Hazelnut. I have eaten my fair share of Ritter sport chocolate hazelnut bars and I'm curious how Ghiradelli measures up. What a bummer about the hazelnut! I'd want to try the almond because you raved about it and I trust your choice in chocolate! Oh I would so love the Milk Chocolate. I love chocolate and come from a long line of Chocolate lovers. Almond Almond Almond! And whose the luckiest blogger in the world to be offered a chocolate giveaway?! nice job lady! I would love to try the almond! I love Ghirardelli and would like to try the hazelnut flavor! Normally I'd say hazelnut, but I guess almond now since you talked it up so much! I once made brownies with a layer of the Ghirardelli caramel-filled squares in the middle -- A-mazing! Awesome giveaway! The hazelnut flavor sounds incredible - I'd love to try it! Chocolate! Gimmie : ) I think the hazelnut flavor sounds delish! I'd want the almond one. There's nothing better than chocolate and almonds. mmm the almond for sure. how could you not after the description? Plus, I don't want to chance it and risk a bad batch w. the hazelnut! I would love love to try the almond. I'd love to try the almond flavor. I love chocolate!